TS G.O.RT.No. 1082 Constitution of Committee to resolve the grievances of ExServicemen’s. 1.In the reference read above, the Director, Sainik Welfare, TS, Hyderabad has requested the Government to constitute a Committee for resolving the issues of Ex-Servicemen. 3. The tenure of the Committee shall be for a period of two years. 4. 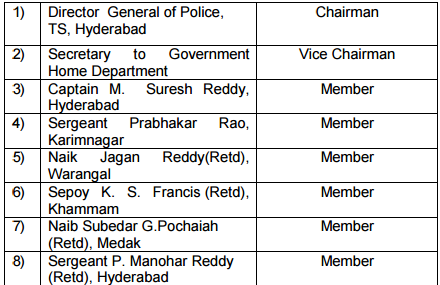 The Director, Sainik Welfare, TS, Hyderabad shall furnish a report on the work done by the Committee at appropriate time.